The ICC have awarded the next two World Twenty20 tournaments in 2012 and 2014 to Sri Lanka and Bangladesh respectively, while England will host the Champions Trophy in 2013. The 2015 World Cup will be held by Australia and New Zealand and the 2013 Women's World Cup will be played in India. The decisions were announced after a meeting of the ICC board in Singapore. The Chief Executives Committee (CEC) and Governance Review Committee (GRC) working groups met jointly to discuss the ICC events programme post 2015, the frequency and format for global events and qualification for those events, and the introduction of Test and ODI leagues to provide context to the traditional formats of the game. A CEC working group has been set up to assist in developing a workable solution. The group, comprising David Collier (England and Wales), Nishantha Ranatunga (Sri Lanka), N Srinivasan (India), James Sutherland (Australia) and Dave Richardson (ICC general manager, cricket) will meet again with the GRC before submitting a proposal for the CEC to consider at its September meeting. 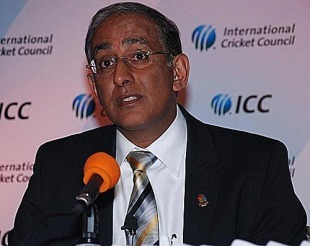 Haroon Lorgat, the ICC chief executive, said the council was considering using Twenty20 to spread the popularity of the game and curtailing participation in the 50-over World Cup. "There is clearly an appetite from all quarters to examine the make-up of the ICC Cricket World Cup and the ICC World Twenty20 and seek the best balance between excellence and development," he said. "In terms of the number of participating teams, it is possible that the World Cup could be reduced and the World Twenty20 expanded. "Although we have made good progress, this exercise requires more work. We know there are exciting opportunities to protect and promote all three formats but we must exercise patience as we consider all aspects in introducing context and content in international cricket."